The Boar's Head is set at the top of town in the Market Square. 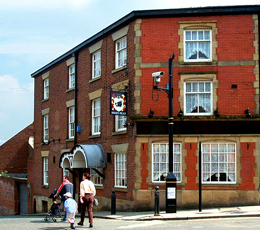 It is one of a number of pubs in the square itself. This was also the second Sam Smith's pub I'd visited in town. It was much busier than the Queen's Head. There are multiple rooms and despite it still being morning, most tables were occupied with drinkers who seemed to be setting in for the day. OBB is the usual ale. Service was without a smile. I settled down with a half of the OBB in the rear room, where one elderly gent seemed to make every other word 'the f word'. Certainly a locals' pub. The beer quality is not as good as the Queens,(also Sam smiths), took beer back only to be told everyone else likes it. So that makes it ok then! I've noticed a few Sam smiths pubs are going down the keg road and possibly this is why the cask is going downhill. This place was one of my regular haunts, not anymore. We called into The Boars Head on our Stockport pub crawl last Saturday (28.03.14). One real ale was on offer, Sam Smiths Old Brewery Bitter. This was in great condition and great value. I do like OBB, but do admit to missing Museum Ale (which was withdrawn years ago!!). Also the pork scratchings need mentioning, as they were great too! 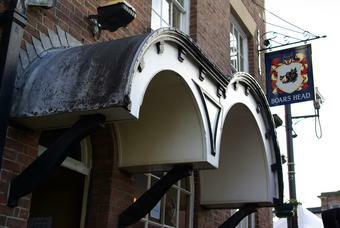 The pub comprises of lots of different rooms and is very comfortable with nice traditional décor. Again, this was another pub that was very busy during our visit to Stockport. Well worth a try if you are in Stockport. As Snapdragon says, a good place for a social chat and a leisurely couple of cheapish pints (�1.85 for the Bitter), and the busiest pub I saw in central Stockport on Sunday. Beer was OK, though I find Sams a bit sour compared to how I remember it in the nineties. As is normal, this is a lovely (multi-roomed)pub architecturally. Some basic pub food would be good. I had occasion to look up this pub on the internet this evening and was disappointed to find most of the reviews and comments are out of date, as the details pointed out they might be. One comment I found, dated back to 2005, so I felt a few words to bring it more up to date were somewhat overdue to help to do some justice to the present management. Basically, some of the adverse comment needs to be deleted. It really is out of date. The next major point seems to be the availability of food. I note one reviewer wrote about having food there in September 2009. However, to clear up another reviewer�s doubt in November 2010, there has been a change of management and to my knowledge, food has not been available since � apart from crisps and nuts etc. The clientele is still varied, to say the least, as I found at a low point this evening, when someone in a motor-bikers outfit would not let me get in. I have hip trouble and the two steps are steep but he would not get up to let me pass. That is what prompted me to look for the pub phone number this evening. However, the present management took steps to improve the pub from what it was and the sort of image it apparently had � as reflected by some of the old comments still posted � when they took over perhaps close to two years ago now. Even the hand drier in the gent�s toilet, which had a fault for over two years, has been replaced by the brewery recently. On the whole therefore, it is now a better place for a social chat � perhaps over a couple of pints on the way home, as I do � which is what pubs used to be for � not for TV and head-banger music, which destroy social interaction and even the art of it. Sam Smith�s have got that right, in my opinion. They have also got through a recession with that policy, so it seems enough other people think so as well. It is just a shame the taste of the beer is not a bit more encouraging after all the years they have been brewing it and that there is apparently no snack food available at this pub now. Traditional pie and peas, for example, would be nice, occasionally, even if they did not want to extend to burgers and such things in these healthy-eating-sensitive times.